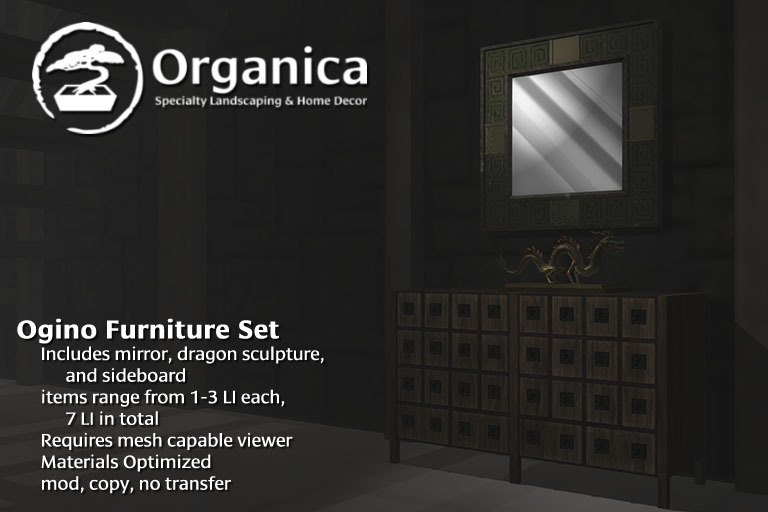 New Furniture and Decor at Organica this week! Today, I thought I’d share a new thing I’ve been working on, on top of a few other things that I can’t discuss quite yet. I’ve always loved older furniture and one of my prized finds this year was a Duncan Phyfe drop-leaf table. It’s sort of hard to pick these up any more. Most are at least 75 years old at this point and they only come available every once in a while in Toronto, even though the occurrence of downsizing and estate sales seems quite high. 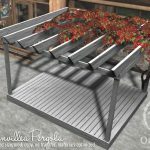 I managed to bring home one for a good price this past fall and it’s been both a beautiful yet unobtrusive addition to my kitchen, mostly in that it is so flexible in the way of footprint. In any case, I decided to put together something with similar functionality, and here is the result. 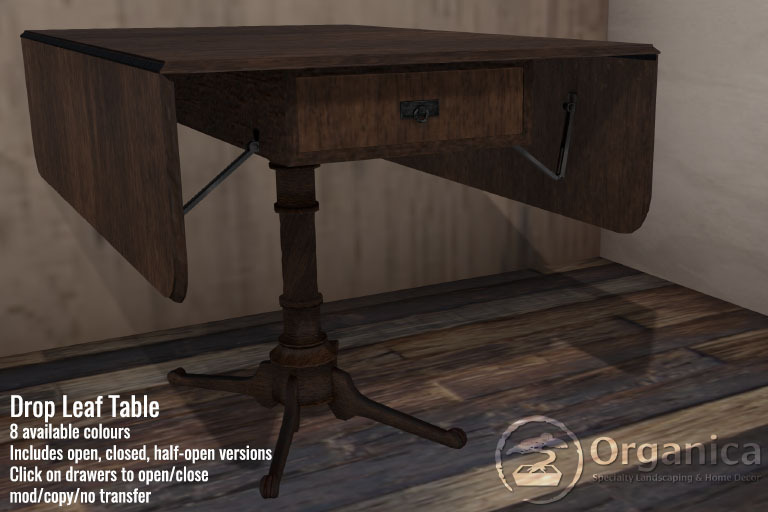 For the moment, this table will come as three static versions, with movable drawers, all in one package. Ideally, I would like to take this in to an Animesh format in the future, so that a single scripted object would be all that is necessary to rez. We’ll see how well this works in practice in the following few weeks, provided available time. This current version is mod, copy, no trans, 5LI ea and available in 8 colours. It will be eligible for free updates if/when an Animesh version is made available. 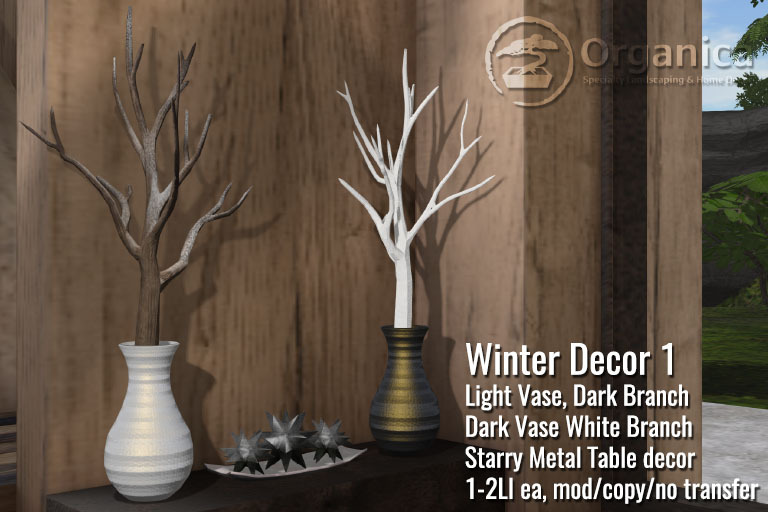 Additionally, there are a few light decor items being released this week as well, including some vase and table accent pieces, as well as some original inkwash artwork by Florence Chan (me). Everything mentioned above is now available in-store or on the Marketplace! 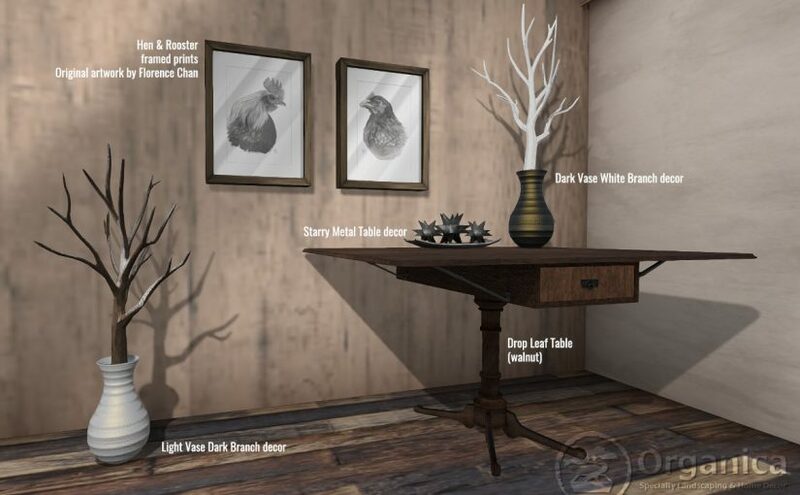 Background environment is Scarlet Creative’s Mountain Lodge gacha rare, by Charlotte Bartlett. 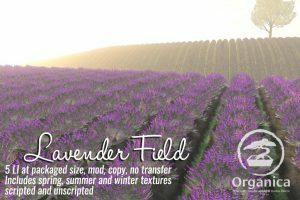 This new field item includes both scripted and unscripted versions of a mesh tile which can be used to create lavender fields! 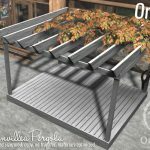 Great for small gardens or large fields. 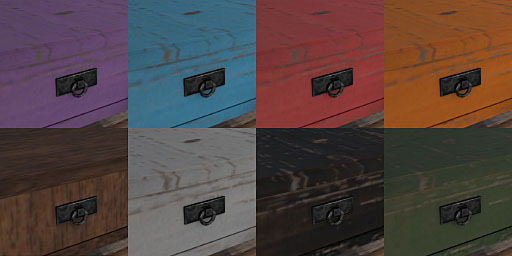 Mass texture change available by linking multiple copies together. Mod, copy, no transfer, with copy only scripts. Available In-store and on the Marketplace. 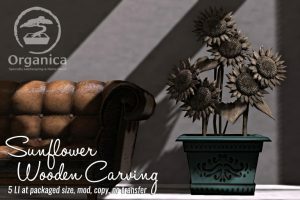 This new wooden carving is now available for home decor! 5LI at packaged size, mod, copy, no transfer. Available in-store and on the Marketplace. New Kitchen Items out Today! 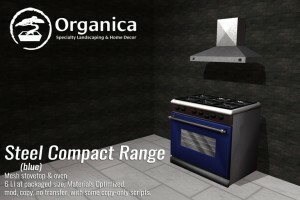 This release focuses mainly on the kitchen; namely, two new appliances and a full kitchen cabinet set! 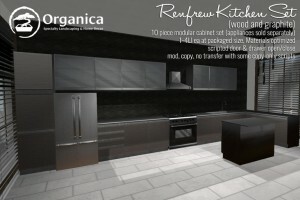 This kitchen set includes ten cabinet pieces and an overhead lamp. 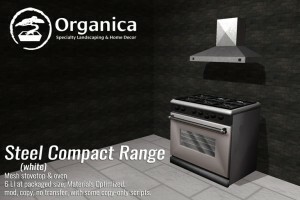 Pictured appliances are sold seperately (see below). Pieces range from 1-4LI each and all are Materials Optimized. All cabinet doors will open/close on click. Mod, copy, no transfer, with some no-mod scripts. These ranges (each sold separately) are 6LI each and have functional burners and oven door. Click the dials to turn burners & oven on and off. Click the oven door to open/close it! Materials Optimized, mod/copy/no transfer, with some no-mod scripts. 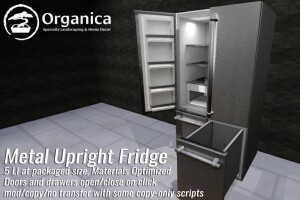 This fridge is 5LI and has clickable doors and drawers which open and close. Materials optimized, mod, copy, no transfer, with some no-mod scripts. 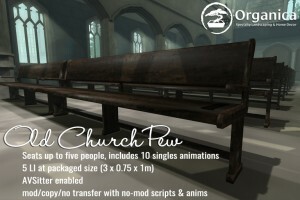 Not kitchen-related, but a new wooden pew is now available! 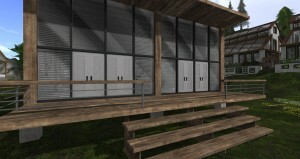 These are 5LI to accomodate up to five seated avatars and include ten singles animations! Materials Optimized, mod, copy, no transfer, with some no-mod scripts. 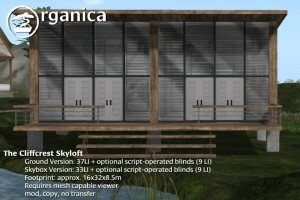 New this week at Organica, check out this set of horizontal pleated blinds! 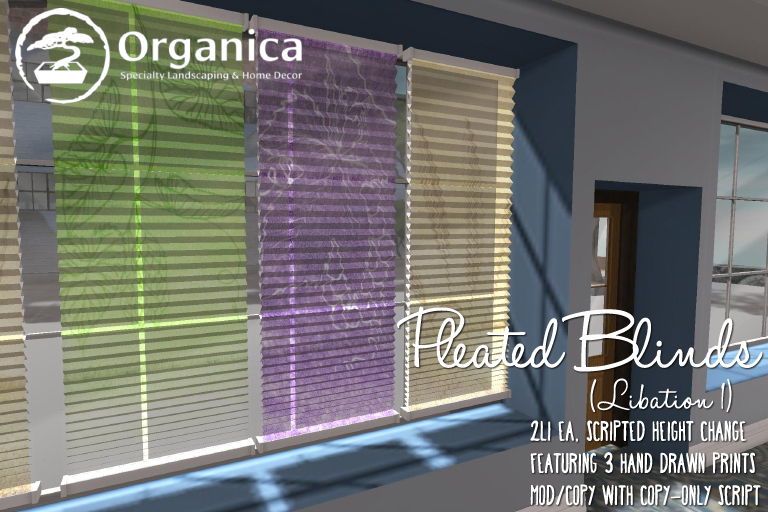 They’re great for any window and can be adjusted for full length through a simple setup & confirmation! Once set up, you’ll be able to set them open, quarter, half, 3/4 or fully closed. This set features hand drawn prints of hops, barley and grapes. Each blind is 2 LI and mod/copy with a copy only script. Much thanks go to NeoBokrug Elytis of Desolate Studios, who provided scripting help for this item. Six new hand-crafted scratchboard prints! Happy New Year! Six new hand-crafted scratchboard prints are now available! 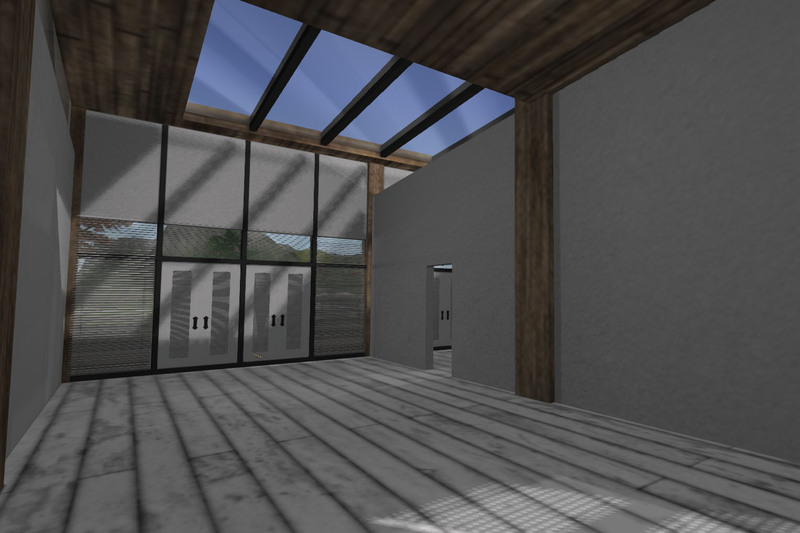 They are mod/copy, 1LI each, and require a mesh-capable viewer. They feature artwork by me (Florence Chan/Aki Shichiroji), scratched by hand from clayboard blocks and ink. To pick these up, please visit the furniture shop – they are L$200 this weekend only via The Neighbourhood promotion! New Releases for The Arcade and The Neighbourhood! 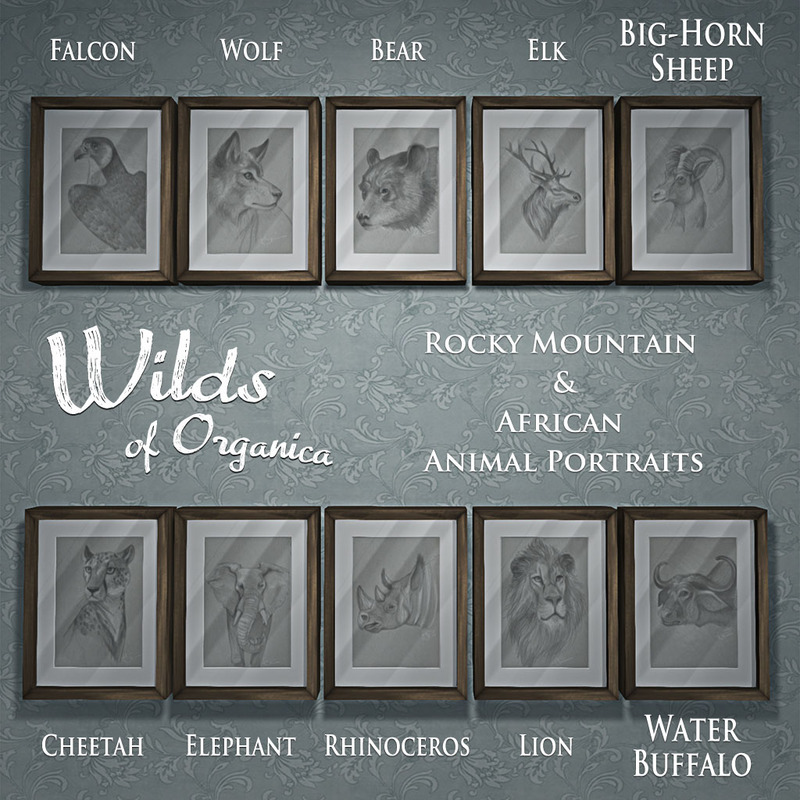 The Arcade starts again in less than one day, and I’ve put together a collection of my wildlife sketches for you to pick/choose from or to collect! 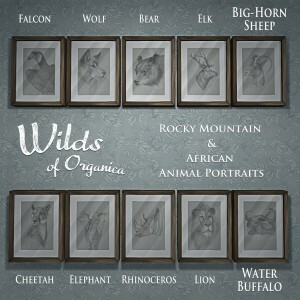 The series features two groups; the ‘Big Five’ African animals, and some well known majestic animals from the Rocky Mountains! 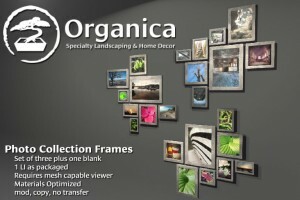 Each piece is 1 LI each and suitable for hanging in any home or office. They are offered transfer-only, but as usual, I recommend that you exchange your transfer-only item for a mod/copy edition. The usual exchanger instructions also apply to these items; please exchange them in the same area as the avatars. These items are L$50 per play and you’ll have an equal chance at winning any one of them. Visit The Arcade starting June 1 here! 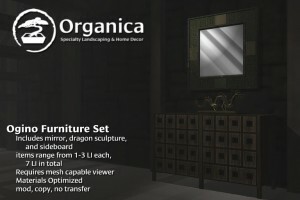 This furniture set features three items; a sideboard, mirror and Asian-style dragon sculpture. 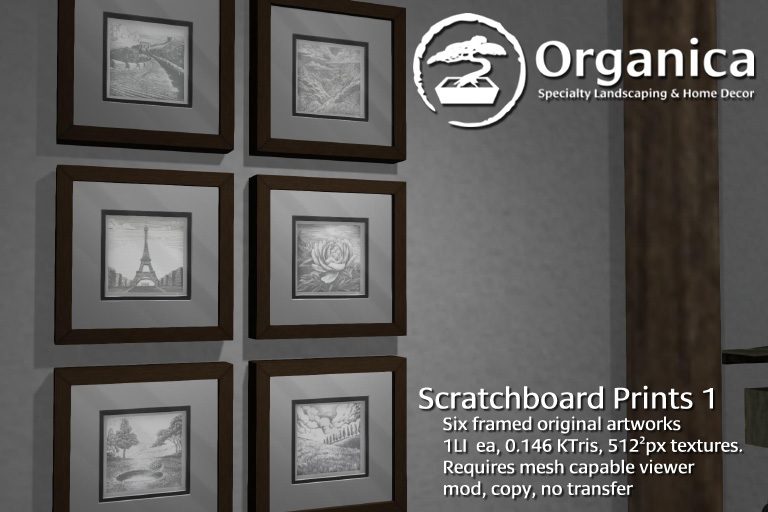 All are original mesh & textures, optimized for use with Materials-capable viewers, but of course also usable with any viewer which is mesh-capable. Items range from 1-3LI each, for a total of 7LI altogether. 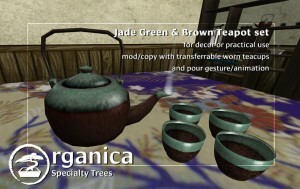 This item is mod/copy/no transfer, and can be picked up now at the Organica Main Store. Something Old, Something New… Oh. and a Sale. 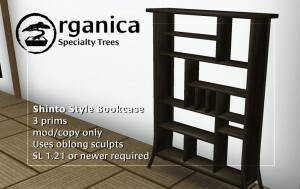 It’s nearly been a month since my last post and just to catch folks up to where things are at now with Organica, The Home Show closes in a couple of days, so if you would like to explore a great collection of home and garden decor shops all in one place, you only have a few days to do so. Organica items which were showing exclusively at the event will make their way to the main store and you’ll be able to pick them up like any other normal release. This package of photo frames features three collections of photos I’ve taken over the past three years. It also includes a blank copy of the frames, which would allow you to add up to 8 of your own photos! It’s unscripted, mesh, and optimized for materials-enabled viewers. 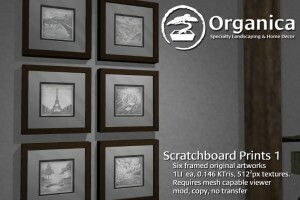 1LI each, mod/copy/transfer. Available in store and on the Marketplace. 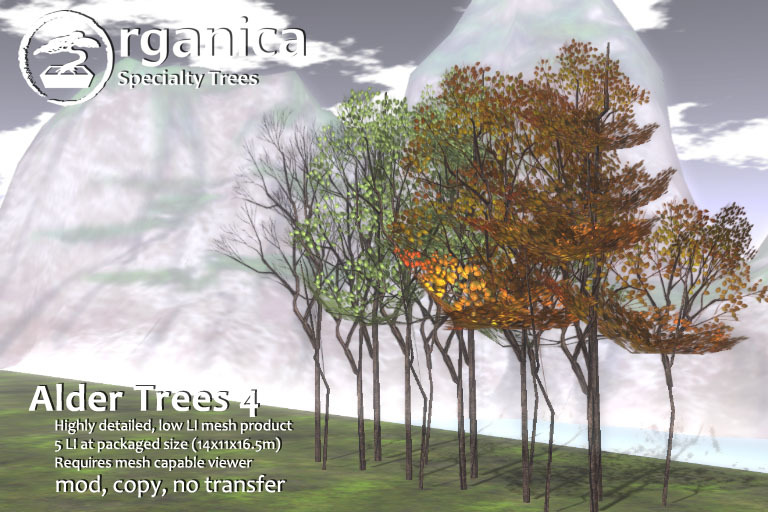 These new additions to the Alder line are lightweight mesh trees featuring upward or ‘apical’ growth and foliage for multiple seasons. Each package includes unscripted green, autumn and winter foliage trees, as well as one scripted version which switches between the three. 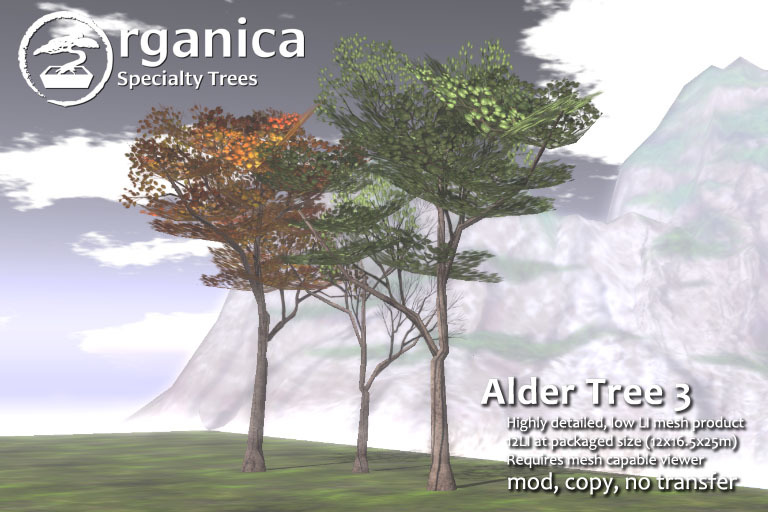 Alder 3 is a single tree at 12LI (at a packaged size of 12x16x25m), while Alder 4 is a cluster of trees coming in at 5LI (at a packaged size of 14x11x16.5m). 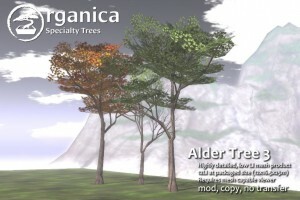 Both trees are available either as mod/trans or mod/copy editions and both are now available in the main store or on Marketplace (Alder 3, Alder 4). 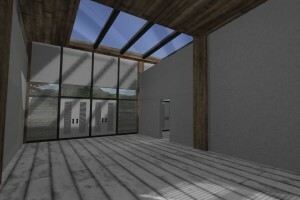 Next, a new building is now available, suitable for both ground and sky use. 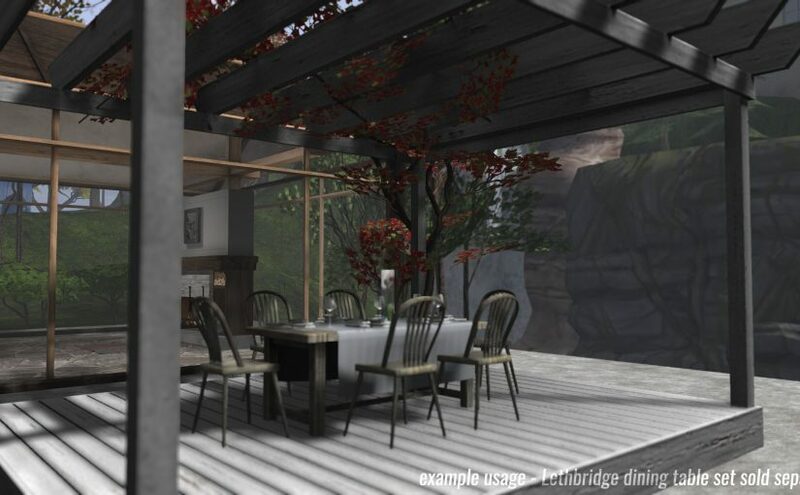 The Cliffcrest Skyloft was initially conceptualized to be modern skybox taking advantage of large windows and a skylight to let in light. 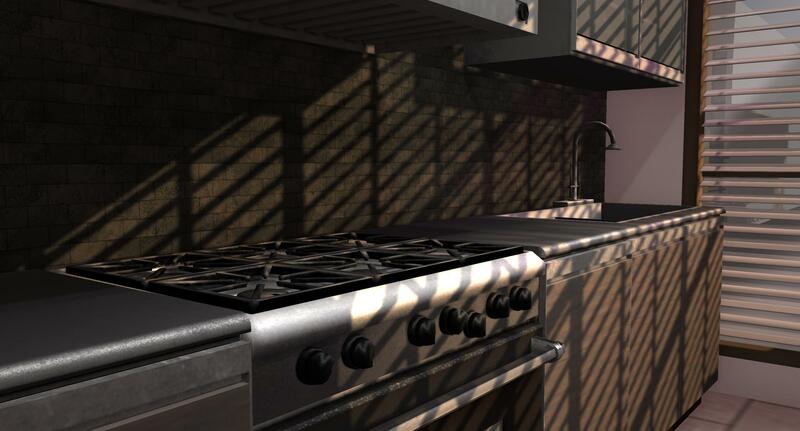 As such, while there is slight shadow baking applied to this building and all users should be able to enjoy it that way, it is suggested that you enjoy this building with deferred rendering enabled. This build allows for some limited modifications – the build is divided in half, but the central wall can be removed, as can both balcony railings, foundation posts and stairs (on the ground version). By default, each coalesced object included in this package includes script-operated blinds for control in opacity. These are optional and not directly linked to the building, so you can use or remove them as you see fit. 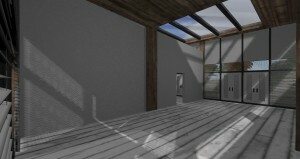 The overall layout is also intended to be useful for either residential or commercial use. Available mod/copy, in-store on the grounds as well as on Marketplace. 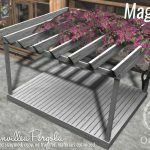 It’s been almost a year since the last major store sale and revamp, and in preparation for some major upcoming changes, a variety of products have been marked down and will remain so until they are permanently retired on August 17, 2013. PLEASE NOTE: mod/trans versions of discounted items are being retired immediately – they are no longer available. If you wish to send a copy of these items as a gift, please left click the vendor box and follow the directions. After August 17, the store will be closed temporarily, after which I am excited and look forward to introducing many new products! 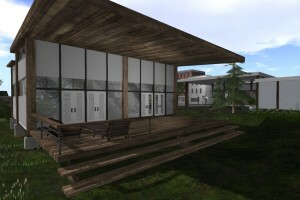 Drop by soon and check out the new items and sale, here! Two home items, one new tree! There are a number of new releases this week! 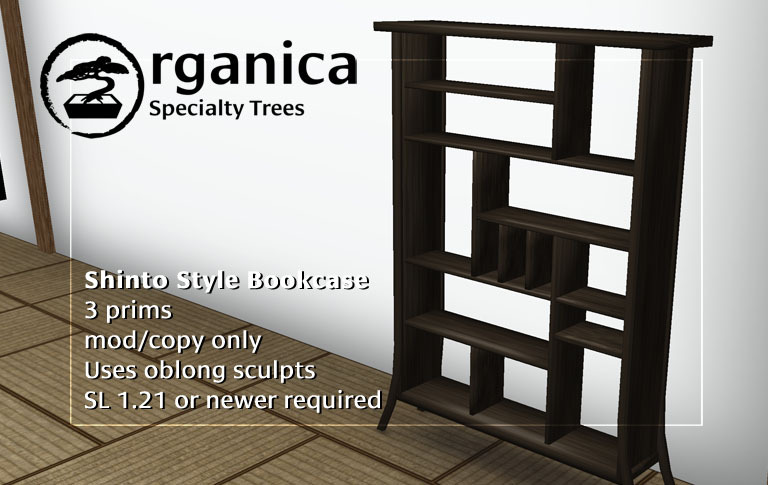 This is a bookcase made from sculpties, so you’ll need to rez items on the ground then place them on the shelves. 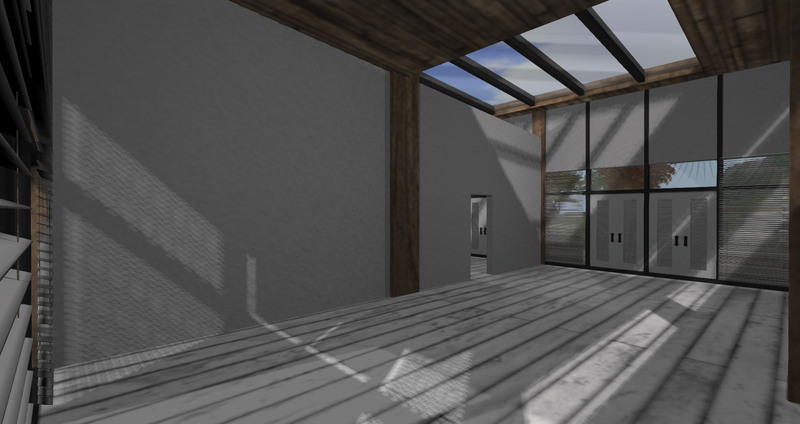 Low prim, Asian design, realistic lighting and shadow base. 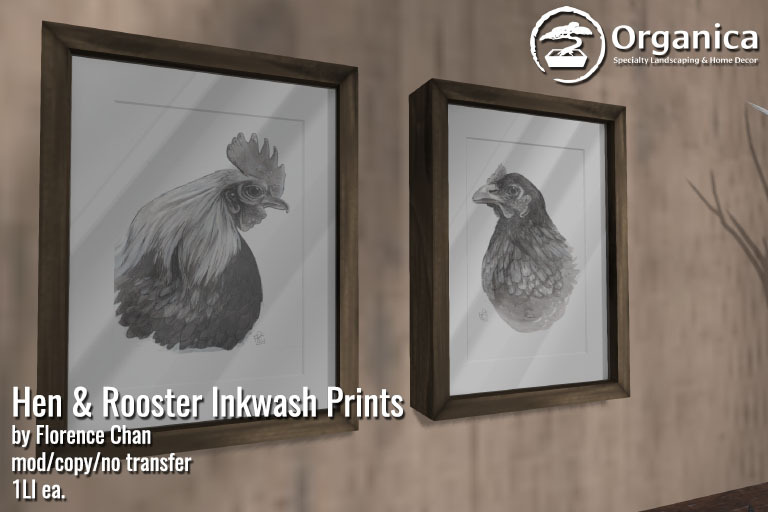 Great for your home! Available mod/copy only. This is both a decorative and functional tea set. 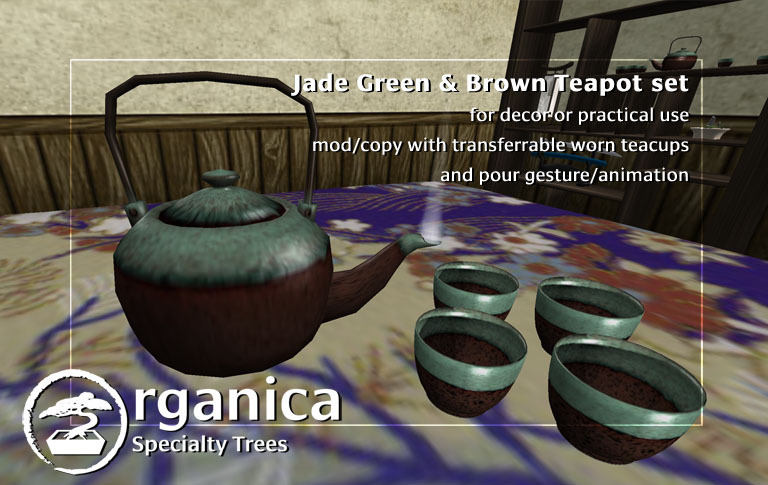 Scripted and unscripted versions of the teacups are available (for wearing) and it’s possible to make the teapot steam when clicked. A pouring gesture is also included so you can pour tea while holding the teapot in your hand. Available mod/copy only. 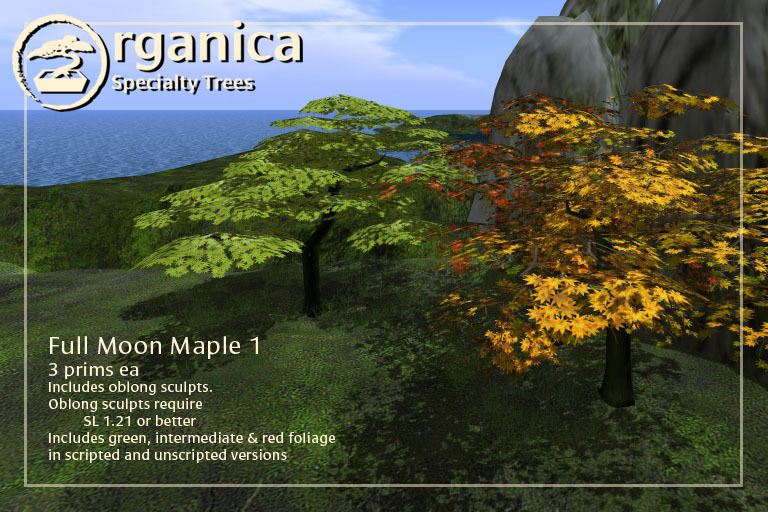 Folks who have been following Organica for a while may recall a couple of Acer tenuifoliums which were made many many moons ago and which were relegated to the discount wall. Well, finally I’ve gotten my act together and put together a new version of that tree; it’ll be known by its more colloquial name, the Full Moon Maple. This new tree comes with sculpted foliage and more efficient trunk. 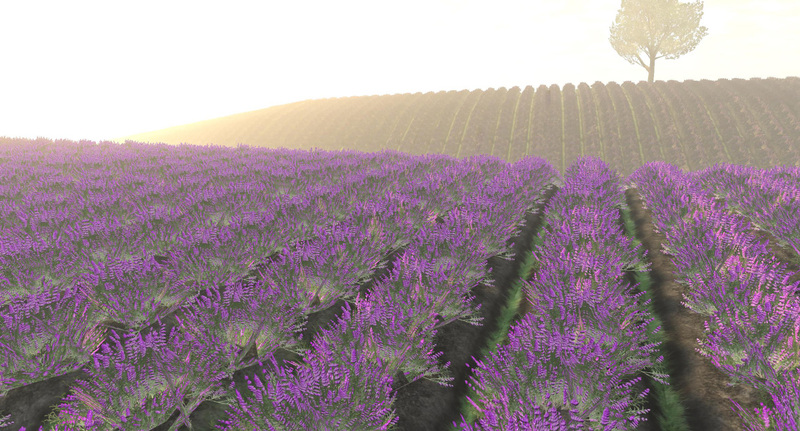 The foliage has also been completely redone to take advantage of the sculpt type most of my trees are made with now. This tree comes with: green, ‘turning’ and red versions (unscripted), foliage changing (scripted), and particle emitting (for leaf drop) on the ‘turning’ and ‘red’ versions. Available mod/trans or mod/copy. 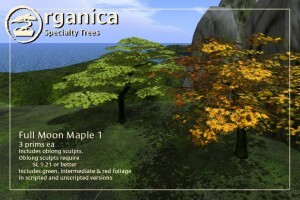 As always, all products are available for purchase at the Organica main store.